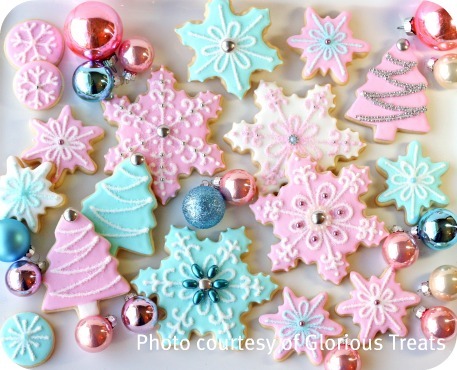 Besides gorgeous and informative cookie decorating books there are so many fantastic on-line places you can learn about decorating cookies with icing. Everyone’s got their own style and take on how they do things; you can learn something new from everyone! There’s University of Cookie (Check out all the cookie professors such as TidyMom and Cookies and Cups there! ), and these talented ladies; Bake at 350, CakeJournal, I Am Baker, SweetSugarBelle and The Decorated Cookie, who have been so kind as to guest post or be interviewed on Sweetopia and all of whom are extremely talented at their craft! Early last week I posed a question to you all on facebook asking where more of your favorite on-line places to learn about decorating cookies with icing were. The results are below. Many of you may have found these talented people already, but juuuust in case you haven’t, here they are, sharing one of their favorite cookie decorating tips as well! 1. Glory of Glorious Treats – My blog is the place I enjoy sharing my sweet and crafty projects. I love baking, party planning, crafts and photography and love having a place to share my creative passions. One my favorite tips to offer cookie decorators is to take the time to prepare a clean and organized work area. If you make sure to set up all of your supplies… toothpicks, paper towels, a moist dish cloth, a tray for your decorated cookies… you will be able to work efficiently and be able to enjoy your decorating time without interruptions (I can’t help you with interruptions from children!). 2. Hani of Haniela’s Food & Photography– Hi. I’m Hani, I’m a friend, baker, photographer and now also an editor of Haniela’s. I love making decorated cookies, cupcakes and my newest adventure, cakes. My baking world turned around when I started making decorated cookies – I think of cookies as little works of art that you can pop in your mouth and eat, and for me personally they are as much visual arts as culinary arts. My tip for you is regarding storing royal icing and fondant decorations. If properly stored, royal icing and fondant decorations will last indefinitely. If exposed to too much humidity these decorations can be damaged. I store all my decorations in small plastic containers with a pack(s) of silica gel. I’m sure you’ve come across Silica Gel Pockets at some point; they can be found in a box of a newly bought shoes, electronics and other items – it’s that package that says, “Do not eat”. Tyvek and Cotton Silica Gel packets both meet FDA requirements. That being said, the standard for dry food packaging is Silica Gel in Tyvek, simply because Tyvek is more tear resistant and omits less dust particles then Cotton Packaging. My favorite cookie decorating tip (and probably the one I get the most feedback about) is the plastic-wrap bag-filling trick. It’s probably my most simple trick, but also the most useful and best time-saving trick I have up my sleeve. Basically what you do is wrap up your prepared, colored frosting in saran wrap before filling your bags, and then slip the whole bundle right into your bag. 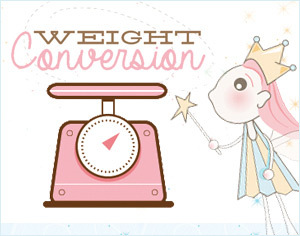 It works for all frosting consistencies, from runny to stiff. It’s a super-easy trick but hard to explain using words, so I made a video to show you how it’s done here. I love this trick for a couple of reasons. The first and most obvious is that it cuts WAY down on the clean-up mess. When you run out of a color, just pull the old, empty plastic wrap bundle out and insert the next one. It takes about 30 seconds, so you don’t get thrown off your decorating groove. Also, I can “refill” my bags 2 or three times before I wash them out, so it considerably lengthens the life of disposable bags. (And yes, I do wash my disposable bags. Does that make me cheap… or smart? We’ll go with smart!) Another reason I love doing it this way is because I can get all of my frosting ready at once, and it’s automatically airtight and safe from drying out once it’s bundled. I’ll just put all of my “bundles” in a ziploc bag and pull them out as I need them. Fast, easy, painless, and it leaves much more time for the fun stuff– Decorating! 4. Melissa of MyCakeSchool – MyCakeSchool.com is a website for creative cake & cupcake decorating instruction through the use of over 150 online video tutorials (and counting!) We also have tutorials on other sweet treats, such as cookies, cake pops, & more! Members can access our videos, message boards, & recipes… and our blog, which includes weekly tutorials, is open to everyone. 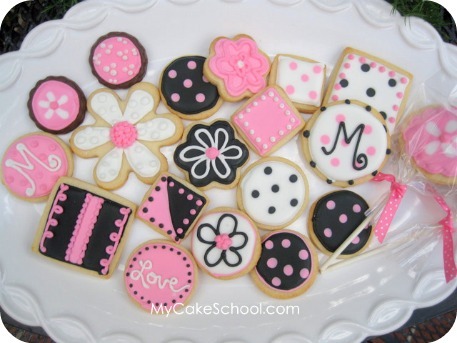 My tip would be to vary the designs of your cookies or cupcakes while staying within the same color scheme. Doing this always makes for a fun presentation! 5. 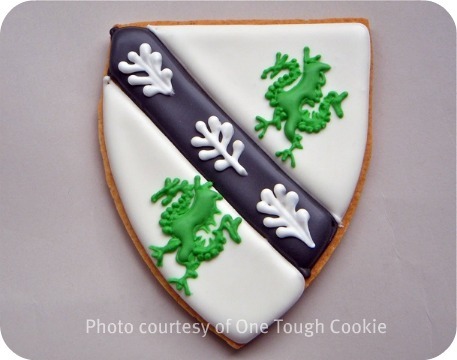 Gail of One Tough Cookie – Born with a sweet tooth of epic proportion, Gail Dosik gave up her career in designer women’s fashions to study Pastry Arts at The French Culinary Institute in the Soho, New York City. After graduating at the top of her class, Gail worked for other noted bakers in the city. The more she learned from others, the clearer her path became. 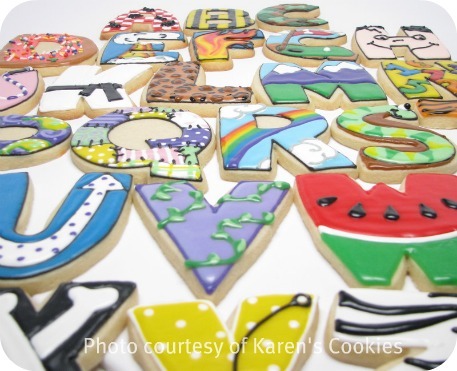 In 2005, One Tough Cookie, Inc. was born, and since then, Gail’s been delighting children of all ages with her deliciously whimsical cookie and cake creations. My tip is on piping tips. We all have scads of them for piping, drop flowers, basket weave and so on. My favorites are made by a company called PME. I resisted them for a long time because they’re pricier than Ateco or Wilton, but once I succumbed, I was hooked. They’re seamless. If you’re like me and use them to cut small circles, this is invaluable. And, they’re stainless steel, not tin. They clean up easily and don’t rust so I don’t fret about contaminating icing. And, they have half size openings, like 1.5 and 2.5. I LOVE THAT! 6. Pam of Cookie Crazie – A very blessed wife, mom of five young adults, laboratory medical technologist, who is absolutely CRAZIE about decorating cookies to raise money for Ukraine missions. Favorite decorating tip: Store your cookie cutters in plastic bins that have shallow drawers so that all your cookie cutters are easily seen as you open each drawer. This allows you to quickly peruse your cutters when you’re trying to find that perfect shape……but also keeps your cutters neat, organized, and easily retrievable. A huge thank you to the talented cookie decorators for being here and for sharing their photos and favorite tips! It’s much appreciated! It’s no secret that I love making (and eating), sweets of all kinds, but decorating cookies has a special place in my heart. There’s something so satisfying about creating little works of sugar art, seeing the finished cookies and then giving them away! (The best part next to decorating). Thank you for putting together this great post. Marian, thanks for posting these resources! 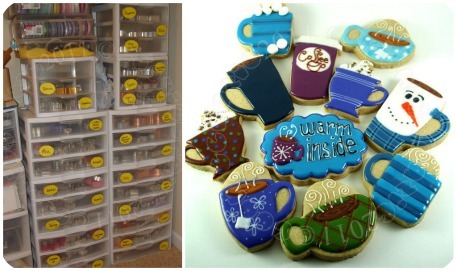 I was immediately taken with Cookie Crazie’s picture – I’ve been giving serious thought to revamping my baking storage because I have stuff everywhere. Would love to see a column about it if you have tips, or a guest post from Cookie Crazie (just because she looks so organized). Wow – thanks for posting all of these sites! I already follow a few but it’s always nice to have more resources! Wow, a cookiedecoratingpalooza of info! Thanks so much for pulling it all together in one place. Don’t you love how one very talented woman (YOU!) 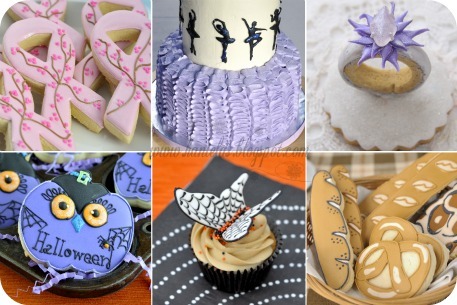 is so open to other ideas from other “very talented women!” I chuckled when Karen said her web site was a jumping off point…I’ve been there and jumped myself…thanks to all of the talented women who continue to inspire us royal icing addicts…. Thank you for this great post Marian! I would love to win this sweet set!!! I just wanted to say, “THANK YOU” for your tutorials and videos. I just ventured out into royal icing decorating…very time consuming, but how rewarding! I did 5 dozen pink onesie cookies with the “marbled hearts”. The mom to be LOVED them! Thanks again-I love your website!